Image Courtesy of Goran M. Amin. During their zenith from 10th century BC to 7th century BC, the Assyrians controlled an enormous territory that extended from the borders of Egypt to the eastern highlands of Iran. To that end, many historians perceive Assyria to be among the first ‘superpowers’ of the Ancient World. However the core realm of Assyria more-or-less pertained to the many banks and tributaries of river Tigris, in what now constitutes upper Iraq. This scope of historical legacy had been recently attested by findings in Erbil (in March, 2017), the thriving capital of Iraqi Kurdistan. 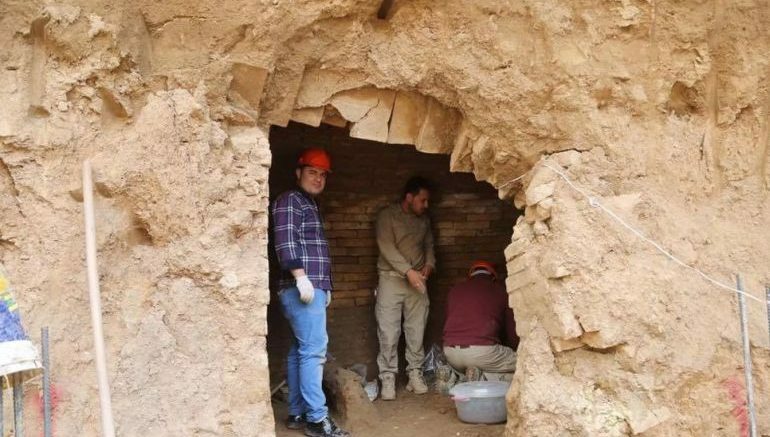 To that end, archaeologists led by Goran M. Amin, in collaboration with the Directorate of Antiquities in Erbil, have discovered a baked-brick tomb structure with three ceramic sarcophagi (with two skeletons). These were accompanied by eight other skeletal remains on the floor and 40 jars of various shapes and sizes that were relatively well preserved for over 2,700 years. In terms of history, the tomb dates back to the period between 9th – 7th century BC, which as we mentioned before, conformed to the apical stage of the Neo-Assyrian Empire. In fact, the researchers had confirmed that the Erbil tomb is quite similar to the ones found in other major Assyrian cities Nimrud. 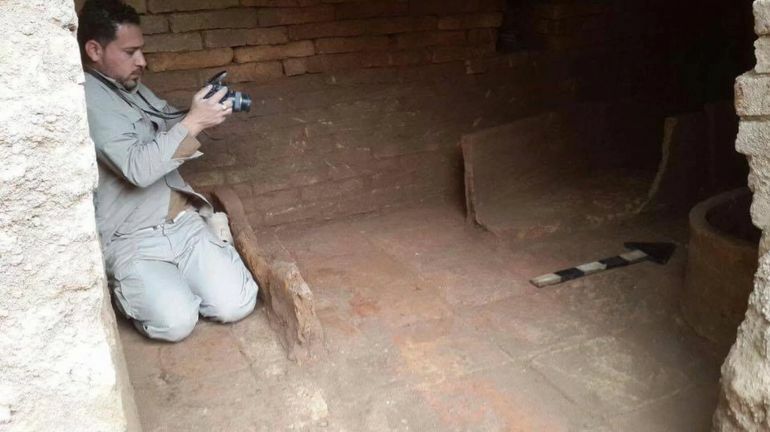 Dishad Marf Zamua, an expert in Assyrian archaeology, has talked about how these tombs were typically furnished for the rich people and nobles of the society. On occasions they were even extended as family complexes to include even more departed members. And since we are talking about history, the ancient city of Erbil (also known as Arbela or Urbilum in Sumerian) had always been an integral part of even the Old Assyrian state, circa 2050 BC. Occupying a strategic position at the foothills of Zagros mountains, the city was the center for the worship of the Assyro-Babylonian goddess of war Ishtar. According to Marf Zamua, several of the Assyrian kings even prayed in her temple before their military campaigns and actions of wars. And beyond just war ceremonies, the temple was viewed as a fortified sanctuary for Assyrian queens during their pregnancy. And as demonstration of the Assyrian elites’ association to war (as a ritual extension of their power), some of the newborn princes were even breast-fed by the priestesses of Ishtar. Arbela and its surrounding area is an important area for understanding the culture and archaeology of the Assyrian heartland. Unfortunately, the recent plundering and destruction in the Assyrian capitals Nimrud, Khorsabad and Nineveh will make future archaeological excavations in this area more difficult.Therefore, Arbela and its surrounding area will be the best option for specialists in the Assyrian archaeology to learn more about the archaeology of Assyria and the Zagros foothills as well. 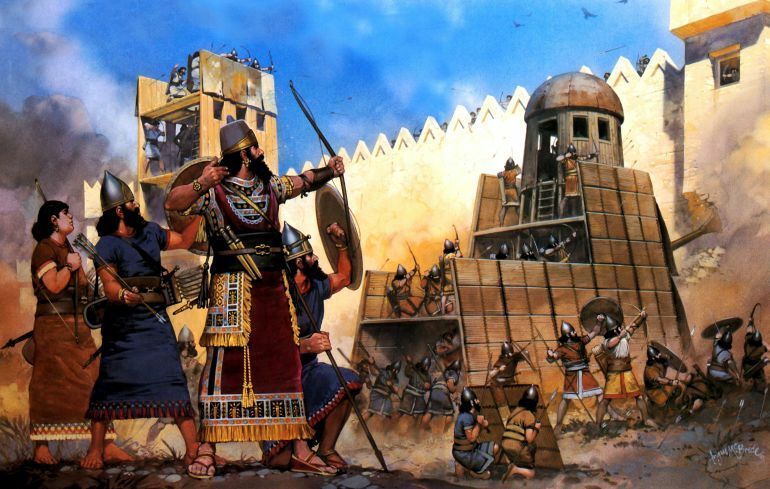 Artist’s depiction of the Assyrian expertise in using ancient siege engines. Illustration by Angus McBride.